Feels like it’s coming… next week. 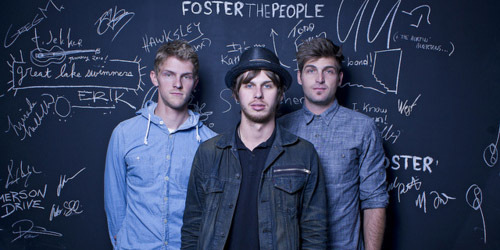 In 2011, the trio of Mark Foster, Cubbie Fink, Mark Pontius, better known as Foster The People, turned an Alternative #1 hit into a major crossover with a very unusual sounding record, “Pumped Up Kicks”. This was nearly two years after Foster posted the single as a free download. Parent album Torches debuted in the top ten on the Billboard 200 and it was certified Gold. It also led to a pair of GRAMMY nominations for both the album and the single. They might’ve once been the next indie sensation, but the sudden rise of the group and their second full-length effort proves they are here to stay. If you’re expecting another Torches out of these guys, think again. They’ve evolved into a psychedelic pop conscious act on Supermodel, their second album for Columbia Records. The beats are eclectic, but the lyrics are distinctively darker. It’s been called a more natural sounding album for the guys, which I guess is fair to an extent, but the electric elements are still there, not that that’s bad. So, as the three prepare to sashay down the catwalk, let’s walk through the lineup on here. Supermodel begins with an earworm, the reggae-fused and synth heavy “Are You What You Want To Be?”, a track which lands somewhere between 70’s power pop and an 80’s Brit rock vocal from Foster. It would make for an awesome future single as it’s one of the most instant songs of the bunch. From there, we head to 90’s prog-rocker “Ask Yourself”, giving us a taste of Oasis and The Verve vibes. Lyrically, it lands in a more pensive style: “Who said the dreamers always get what they desire?/Well, I found the more I want, the less I got.” First single “Coming Of Age” follows this in third place, a glossy electro-pop dazzler that already has the Alternative chart buzzing. Crossover airplay for it should be coming this summer. Next in the lineup is the also intriguing and chilled out “Nevermind”, which, in turn, just got me to listen to “Everybody’s Got To Learn Sometime” by The Korgis a few times. (Parts of the chord progression in the guitar line are just a little too close to the 1980 hit and I don’t believe it’s a sample.) This blends nicely into the dreamy “Pseudologia Fantastica”, which comes off an update to the late 70’s sound of the Electric Light Orchestra mixed in with a pinch of the Alan Parsons Project. Revolving around a relationship, Foster sings, “Why’d you say that you’d come right back/For my love, for my strength?/All the promises you made never realized.” The false ending is worth noting as well – why don’t more acts do it? It may not be what we expected, but Supermodel is certainly an entertaining affair from Foster The People. Both full of hits and artistic growth, it will no doubt do very well on the charts, especially with “Best Friend” handling the second single duties and a couple of choices for a third release after that. It’s hard to tell whether their star power will get any bigger as a result of this, but the least this will do is maintain their presence at radio and retail, and that’s the core of what you can ask for out of a new album, right? There’s very little opposition to the new sound and some wiggle room for future endeavours – they’re in the right place. It’s just a matter of if the strategy is right, but the new outfit is fierce, honey. They better work.